Cassiobury parkun- one down, one to go! 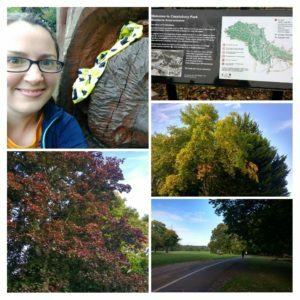 I still needed: Cassiobury (it’s been on my list for ages) and Castle Park (Saturday was the inaugural event as it had moved from Hatfield Forest in Essex)- will I ever get there? I was pondering going back to Westmill- my dad and brother were away cycling (they were doing 30-50 miles a day, cycling somewhere in Spain) and Westmill is fairly local and I’d like to do it again. 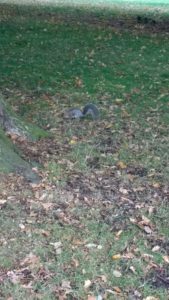 But then I saw on facebook that Letchworth parkrun is coming soon- another Herts one. I mean it’s great, but can’t they just wait a bit until I have finished? Mum had invited me for breakfast, so I decided to head over to Cassiobury- it’s been on the list for ages, but we have never made the effort because it is a busy one (several hundred people), it’s laps (which we are not so keen on) and the parking looked tricky. But I needed to do it (well, to do my challenge) and then I would drive past Mum’s on the way home so it sort of made sense. I had a bit of a panic as I only decided late on Friday night, and I didn’t have enough cash for the parking- it said online that the machines took cards, but when I got there (after a stressful journey around Watford’s one way system) the machine didn’t seem to be working. I ran across the car park to the other machine, but that only took cash- argh! I didn’t know the area so had no idea if there was a shop nearby to get some change with. I went back to the other machine as I could see some people using it and it turned out that the screen wasn’t working but if you followed the steps on the sign it still issued a ticket. Phew. From there it was a very short walk (400m or something) to the finish area in the park. 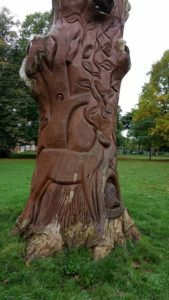 I was there fairly early in the end so I wandered about a bit and took some photos- there was a huge tree trunk with some interesting animals carved into it. The start was a little walk from the finish area, but there was a sign in the ground mentioning the new runner’s briefing, saying “follow this sign”- it looked like someone would pick it up and we would walk after them. However, at 8.50 nothing had happened and I started to wonder if they had forgotten about the sign. I noticed a few other people waiting around, and one of them asked a marshal, who pointed up the path, saying “the start is that way”, so we wandered off. We got to chatting on the walk up- she usually ran at Harrow but had just moved to the area so was going to give this one a go. The start area was full of high viz people, so we asked one of them where the briefing would be, as it was just about 9am. 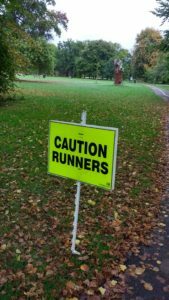 We were shown where, and then told that it wouldn’t be on time as they weren’t known for their punctuality at this parkrun! The briefing was useful as it was not quite a 3 lap course- basically you started part way around the course, running gently downhill (it’s hardly noticeable), turning left at a sharp corner by a marshal, running along the bottom of the park and then up past the finish area to the start area. We were told to pass the marshal at the bottom three times and the marshal at the top twice, which sounded confusing but when you traced the route out, made perfect sense. It was very congested at the start but after the first downhill section it had spread out enough. I didn’t look at my watch but I felt like I was pushing fairly hard at times. 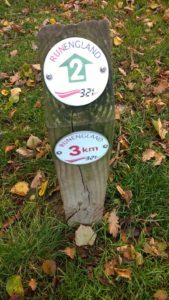 I liked seeing the Run England markers all around the route, and I saw loads of squirrels. The gentle uphill on each lap (well two of them) wasn’t too bad, and you got to run downhill three times which was great. There were lots of people out in the park, some walking dogs or with kids on bikes, and some watching. Watford Joggers, the local running club, even had a banner/flag thing on the downhill section and when I looked on Strava later it must be a regular thing as one of the segments was called Join Watford Joggers! I was pretty pleased to head into the finish feeling strong. Finish position 139, with a time of 27.36- around a minute quicker than last weekend. You can’t see them but my splits were 9.20, 843, 8.39, 8.05- a good old royal flush right there, and nice to see a few miles beginning with 8. The barcode scanning wasn’t immediately obvious, but I found them a little way up from the finish area, and then had a wander around taking a few more photos- the morning had started off damp and cloudy but during the last lap the sun came out so the autumn colours were looking great. 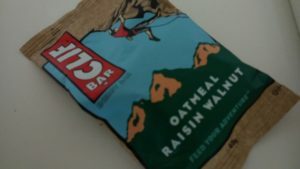 I headed back to the car and had half a clif bar before braving the drive home (where I managed to get a bit lost in a housing estate and ended up coming home a totally different way). When I got to Mum’s she had warmed up some croissants in the oven and made us some Earl grey tea and we had a lovely catch up- a great start to the weekend. So, another Hertfordshire event done- and currently only one left to do- Castle Park. Not sure when I will manage to get there, hopefully November, and I can finally celebrate! I could see the appeal if you lived close, as it’s pretty flat, not too congested even though it is busy, and on tarmac so no worries about mud in the winter, but I still can’t quite understand why South Oxhey (also in Watford, only a few miles away) gets so few participants in comparison. It’s a mystery to me. Do you have busier and quieter events near to you? 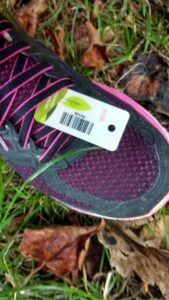 What do you look for in a parkrun? If I see it’s one lap then I am pretty sold! I’ve had a similar ticket machine stress when I needed to get a car park ticket at the train station. Nightmare! I don’t mind laps. I quite like two laps as then I know what I’m in for for the second half. More than three tho and it’s mentally tough. It’s so stressful isn’t it? I’ve had it once when I was getting a train and none of the machines were working, so I ended up getting on the train and calling the parking company from the train- but they said it would be fine- obviously no-one actually checked for parking tickets. Thanks- I need a good name for it now- I saw someone doing all the Suffolk ones saying they had been “Suffolk-ated” which I liked!